Since the Fukushima crisis, Japan has struggled to balance its grid. So how could the addition of more electricity demand in the form of hundreds of thousands of electric vehicles help? As a highly industrialized, densely populated island nation with limited domestic energy production, it should come as little surprise that Japan has faced energy constraints for more than 50 years. What is impressive is how little these limitations have constrained its economic growth during that period. Careful planning and management of the electrical grid have long been critical duties shared by the Japanese government and the country’s private utilities, but after the 2011 Tohoku earthquake and subsequent Fukushima nuclear tragedy, they took on a new urgency. Before Fukushima, Japan relied on more than fifty nuclear reactors to supply nearly a third of its electricity. After the earthquake, the government immediately shut down those reactors, fearing that the safety flaws at the Fukushima facility could lead to even greater catastrophes in the future. Over the decades, Japan had already been forced to become one of the most energy-efficient countries in the world to keep pace with demand and maintain affordable prices. So there was little room for improvement on the demand side. The country’s only abundant source of domestic, non-renewable energy was coal. But expanding coal’s footprint in the energy mix threatened to derail efforts to meet already sharp emissions reductions. Imported fuels like liquefied natural gas are expensive and also increase emissions significantly compared to nukes. Renewable energy infrastructure was limited and difficult to balance between peak and off-peak demand. Liberalization of energy markets now allows hundreds of supply companies to compete, helping to keep down electricity prices. The creation of a “Feed-in Tariff” that offers above-market prices for small renewable energy installations. Billions of dollars of investments in smart grid modernizations like smart meters and test programs for vehicle-to-grid technologies. But even as renewable energy production gradually expands, Japan faces the challenge of balancing load demand with peak generation from sources like solar, wind, and geothermal energy. The country has been the world’s largest user of Pumped Hydroelectricity Storage (PHS)—which pumps water to high elevations during periods of overproduction to effectively act as a hydroelectric battery. There are some shortcomings to PHS though, including poor efficiency, limited scalability, and environmental and ecological damage. Conventional battery capacity is expensive to build and incapable of meeting the full storage needs of the grid. One thing Japan does have working in its favor is one of the largest electric car populations in the world, with more than 130,000 plug-ins on its roads today. It also boasts the world’s highest concentrations of charging stations—particularly high-speed fast-chargers, which are capable of quickly replenishing a vehicle’s battery after it’s depleted. Three of the world’s leading plug-in vehicle manufacturers—Nissan, Mitsubishi and Toyota—also call Japan home. All three companies had been working on vehicle- or battery-to-grid (V2G) energy storage solutions long before the Fukushima tragedy, but the events of 2011 brought a new urgency to the endeavor. In a way, the Japanese people had already beaten them to it. After the earthquake and during the rolling blackouts that followed, many hybrid owners had used auxiliary AC plugs available in their cars (but not sold on United States models) as a source of emergency energy, essentially turning them into generators. During a crisis, this feature can be very handy. For day-to-day purposes, though, using a hybrid to power your home during peak electricity demand hours won’t achieve much outside of spoiled food and added trips to the gas station. 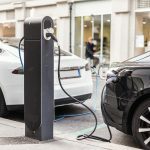 The advantage of fully electric vehicles is that they have large batteries, allowing them to store enough electricity to power entire homes and even businesses rather than generate it using gasoline. The average daily household electricity demand in Japan is roughly half the storage capacity of a first-generation Nissan LEAF— more than enough to help lighten the grid’s load for a few hours a day. What’s more, thanks to the massive popularity of public transit and other forms of transportation, more than half the vehicles in Japan’s busiest cities remained parked on weekdays, making them ideal for vehicle-to-grid or vehicle-to-home applications. In the years following Fukushima, a number of test programs were established in the hopes of laying the groundwork for potentially massive EV energy storage projects. Nissan used stored energy in the LEAF EV along with its LEAF to Home V2G system to power the lights in a showroom of one of its dealerships for several hours at a time over several months. It also donated one system to each of Japan’s 47 prefectures for use at local rest areas for similar test purposes and powered an office building using a fleet of six LEAFs. The LEAF to Home station can provide 100-volt power as well as quick-charging capability to replenish the LEAF’s battery when power switches back over to the grid. Mitsubishi offered Japanese buyers of its iMiEV electric vehicle the option to purchase an iMiEV Power Box adapter, which provides 1500 watts of backup energy for up to six hours. In more typical applications, the iMiEV’s 16-kWh battery would be enough to power the average home for up to 24 hours. Toyota announced plans to build 67 model homes with solar installations and lithium ion batteries to use for backup power. NEC offers an Energy Supply and Demand Management System for renewable power installations, electric vehicle fleets, and manufacturing facilities that produce their own energy. The system is capable of optimizing energy use, storage and the sale of power back to the grid during peak demand hours when Japan’s Feed-in Tariff is most advantageous to producers. Nissan’s LEAF to Home system provides two-way capability and can charge a depleted LEAF in just four hours. Complicating the numerous arguments for Japanese adoption of vehicle-to-grid solutions is the fact that Japan and its largest carmaker, Toyota, are focused on fuel cells as the future of energy storage—not just in cars but for the grid. If manufacturers can make fuel cells cost-competitive with lithium ion batteries they would provide a more powerful V2G storage option—as well as an incentive for owners to use it as one. At a profit of $0.02 per kWh, it’s been estimated that the owner of a fuel cell vehicle could recoup nearly $5,000 per year selling power back to the grid . In the meantime, the similarity between the two energy storage technologies (from the standpoint of the grid anyway) means that setting up smart grid and energy management systems for EVs now aren’t a wasted investment, even if fuel cells do indeed become the dominant technology one day.